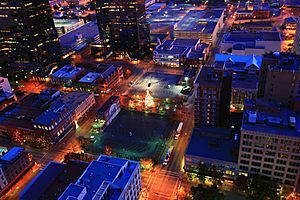 Fort Worth is the 16th-largest city in the United States and the fifth-largest city in the state of Texas. 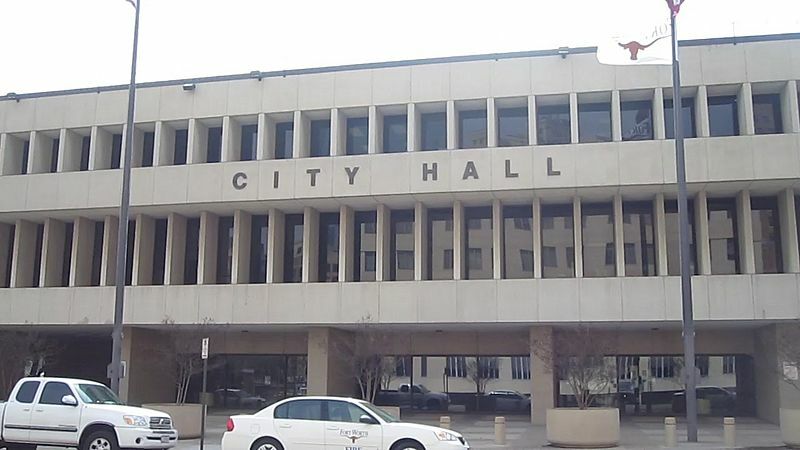 The city is in North Central Texas and covers nearly 350 square miles (910 km2) in the counties of Denton, Parker, Wise, and Tarrant, of which it is the county seat. According to the 2015 census, estimates, Fort Worth's population is 833,319. 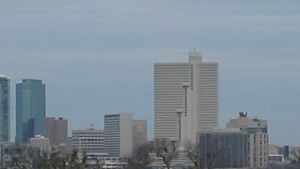 The city is the second-largest in the Dallas–Fort Worth–Arlington metropolitan area (the "DFW Metroplex"). Fort Worth is home to the Van Cliburn International Piano Competition and several world-class museums designed by internationally known contemporary architects. The Kimbell Art Museum, considered to have one of the best collections in Texas, is housed in what is widely regarded as one of the state's foremost works of modern architecture, designed by Louis Kahn with an addition by Renzo Piano. Also of note is the Modern Art Museum of Fort Worth, designed by Tadao Ando. The Amon Carter Museum of American Art, designed by Philip Johnson, houses one of the world's most extensive collections of American art in a building. The Sid Richardson Museum, redesigned by David M. Schwarz, has one of the most focused collections of Western Art in the U.S., emphasizing Frederic Remington and Charles Russell. As a stop on the legendary Chisholm Trail, Fort Worth was stimulated by the business of the cattle drives and became a brawling, bustling town. Millions of head of cattle were driven north to market along this trail. Fort Worth became the center of the cattle drives, and later, the ranching industry. It was given the nickname of "Cowtown". 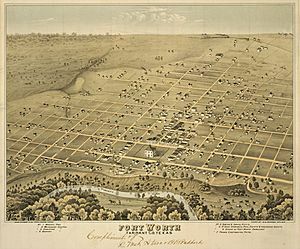 During Civil War, Fort Worth suffered from shortages of money, food, and supplies. the population dropped as low a 175, but began to recover during Reconstruction. By 1872, Jacob Samuels, William Jesse Boaz, and William Henry Davis had opened general stores. The next year, Khleber M. Van Zandt established Tidball, Van Zandt, and Company, which became Fort Worth National Bank in 1884. On March 28, 2000, at 6:15 pm, an F3 (some estimates claim an F4) tornado smashed through downtown, tearing many buildings into shreds and scrap metal. One of the hardest-hit structures was the Bank One Tower, which was one of the dominant features of the Fort Worth skyline and which had Reata, a popular restaurant, on its top floor. It has since been converted to upscale condominiums and officially renamed "The Tower". This was the first major tornado to strike Fort Worth proper since the early 1940s. The Dallas–Fort Worth metroplex is the hub of the North Texas region. According to the United States Census Bureau, the city has a total area of 298.9 square miles (774 km2), of which 292.5 square miles (758 km2) is land and 6.3 square miles (16 km2) (2.12%) is covered by water. Downtown is mainly known for its Art Deco-style buildings. The Tarrant County Courthouse was created in the American Beaux Arts design, which was modeled after the Texas State Capitol building. Most of the structures around Sundance Square have preserved their early 20th-century façades. Downtown has a unique rustic architecture. The city of Fort Worth contains over 1000 natural gas wells (December 2009 count) tapping the Barnett Shale. Each well site is a bare patch of gravel 2–5 acres (8,100–20,200 m2) in size. As city ordinances permit them in all zoning categories, including residential, well sites can be found in a variety of locations. Some wells are surrounded by masonry fences, but most are secured by chain link. Fort Worth has a humid subtropical climate according to the Köppen climate classification system and is within USDA hardiness zone 8a. The hottest month of the year is July, when the average high temperature is 95 °F (35.0 °C), and overnight low temperatures average 72 °F (22.2 °C), giving an average temperature of 84 °F (28.9 °C). The coldest month of the year is January, when the average high temperature is 55 °F (12.8 °C) and low temperatures average 31 °F (−0.6 °C). The average temperature in January is 43 °F (6 °C). The highest temperature ever recorded in Fort Worth is 113 °F (45.0 °C), on June 26, 1980, during the Great 1980 Heat Wave, and June 27, 1980. The coldest temperature ever recorded in Fort Worth was −8 °F (−22.2 °C) on February 12, 1899. Because of its position in North Texas, Fort Worth is very susceptible to supercell thunderstorms, which produce large hail and can produce tornados. The average annual snowfall in Fort Worth is 2.6 inches (0.07 m). The most snowfall in one month has been 13.5 inches (0.34 m) in February 1978, and the most in a season 17.6 inches (0.45 m) in 1977/1978. Building on its frontier western heritage and a history of strong local arts patronage, Fort Worth, in recent years, has begun promoting itself as the "City of Cowboys and Culture". Fort Worth has the world's first and largest indoor rodeo. The Fort Worth Zoo is home to over 5000 animals and has been named as a top zoo in the nation by Family Life magazine, the Los Angeles Times, and USA Today and one of the top zoos in the South by Southern Living Reader's Choice Awards; it has been ranked in the top 10 zoos in the United States. The Fort Worth Botanic Garden and the Botanical Research Institute of Texas are also in the city. For those interested in hiking, birding, or canoeing, the Fort Worth Nature Center and Refuge in northwest Fort Worth is a 3621-acre preserved natural area designated by the Department of the Interior as a National Natural Landmark Site in 1980. Established in 1964 as the Greer Island Nature Center and Refuge, it celebrated its 50th anniversary in 2014. The Nature Center has small, genetically pure bison herd, a resident prairie dog town, and the prairie upon which they live. It is one of the largest urban parks of its type in the U.S. There are two dog parks located in the city including ZBonz Dog Park and Fort Woof. These are both off-leash dog parks. Fort Woof was recognized by Dog Fancy Magazine as the No. 1 Dog Park in the Nation in 2006, and as City Voter's the Best Dog Park in the Metroplex in 2009. The park includes an agility course, water fountains, shaded shelters and waste stations. While much of Fort Worth's sports attention is focused on the Metroplex's professional sports teams, the city has its own athletic identity. The TCU Horned Frogs compete in NCAA Division I athletics, including the football team, consistently ranked in the top 25, and the baseball team, which has competed in the last six NCAA tournaments and 3 straight CWS, coming within a win of making the College World Series finals in 2009 and 2016. The women's basketball team has competed in the last seven NCAA tournaments. 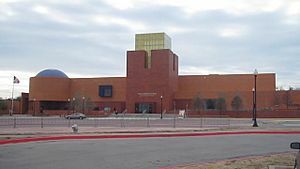 Texas Wesleyan University competes in the NAIA, and won the 2006 NAIA Div. I Men's Basketball championship and three-time National Collegiate Table Tennis Association (NCTTA) team championships (2004–2006). Fort Worth is also home to the NCAA football Bell Helicopter Armed Forces Bowl, as well as four minor-league professional sports teams. One of these minor league teams, the Fort Worth Cats baseball team, was reborn in 2001. The original Cats were a very popular minor league team in Fort Worth from the 19th century (when they were called the Panthers) until 1960, when the team was merged into the Dallas Rangers. Fort Worth hosts an important professional men's golf tournament every May at the Colonial Country Club. The Colonial Invitational Golf Tournament, now officially known as the Dean & DeLuca Invitational, is one of the more prestigious and historical events of the tour calendar. The Colonial Country Club was the home course of golfing legend Ben Hogan, who was from Fort Worth. The Fort Worth Cats were a professional baseball team that played in the city and was founded in 2001, as part of the All-American Association. Their home venue was LaGrave Field. The team was disbanded when the league they played in, United League Baseball, formally ceased operation due to low attendance. Fort Worth Vaqueros FC are a minor league soccer team which began play in the summer of 2014. They are part of the National Premier Soccer League and play their home games at Martin Field. 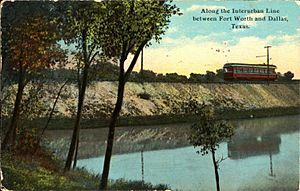 Like most cities that grew quickly after World War II, Fort Worth's main mode of transportation is the automobile, but bus transportation via The T is available, as well as an interurban train service to Dallas via the Trinity Railway Express. The Fort Worth Transportation Authority, better known as The T, serves Fort Worth with dozens of different bus routes throughout the city, including a downtown bus circulator known as Molly the Trolley. 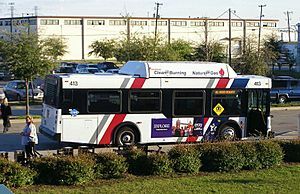 The T operates buses in the suburbs of Richland Hills (route 41) and Arlington (MAX). The Fort Worth Bike Sharing is a nonprofit organization that controls Fort Worth B-Cycle, a bike-sharing program introduced to the area on April 22, 2013. There are 45 stations across the city with 350 bikes available for rent all day, every day of the year. These areas include Downtown, the Cultural District, the Trinity Trails, the Stockyards, Near Southside and on TCU's campus. Their mission is to "enhance our community by providing an affordable, efficient, environmentally-friendly bike share program that complements our existing public transportation system and provides both residents and visitors a healthy, convenient way to move around our city". 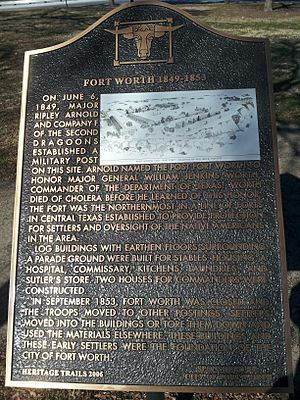 Fort Worth, Texas Facts for Kids. Kiddle Encyclopedia.